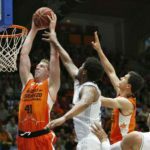 It was a busy weekend in the Spanish Liga ACB with Round 16 closing out on Sunday with six games. One underlying denominator of the key games in the round was that the top teams of the league managed to secure wins. 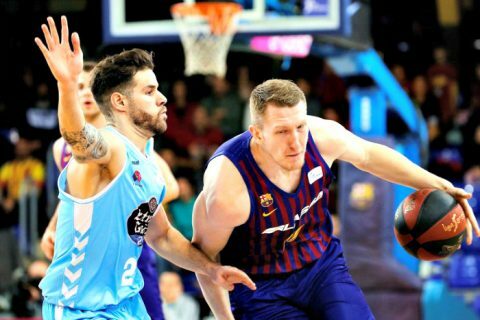 FC Barcelona Lassa remains atop of the standings with a 14-2 slate after securing a win at home over Breogan, 84-80. 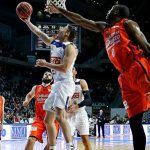 Baskonia and Real Madrid are both two games Barca with identical 12-4 records, with Baskonia at second and Real Madrid at third. Baskonia narrowly edged out Joventut 67-68, thanks in part to the 20-point performance of Shavon Shields who caught fire and knocked down 5-of-8 shots from downtown. The loss snapped Joventut’s three-game winning streak but they remain in that precarious eighth place in the standings with a 9-7 record which they share with Manresa, who currently are at seventh. 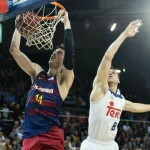 It was another close call but defending champions Real Madrid, squeezed out a home win over Tecnyconta Zaragoza 98-96. Gustavo Ayon erupted for a massive 20-point, 12-rebound double-double, while point guard Sergio Llull added 18 points of his own. The key to their victory came at the free throw line, where Real Madrid went 19-for-24 as a team, compared a 6-of-7 showing from Zaragoza. The guests fall to 8-8 and are on the outside looking in the top-8, one game behind Joventut and Manresa. Arguably, the top-4 teams have a buffer comfort right now, with the mid-pack fighting tooth and nail for those playoff berths. That said, no team is truly safe in a league as competitive as this one. Will Real Madrid defend their crown or will a new team hoist that gold trophy above their heads at the end of 2018-19.